The value of the stiffness modulus of the subgrade is required if the stresses and strains in the pavement and the subgrade are to be calculated. Subgrade strength is expressed in terms of its California Bearing Ratio (CBR) value. The CBR value is measured by an empirical test devised by the California State Highway Association and is simply the resistance to a penetration of 2.54 mm of a standard cylindrical plunger of 49.6 mm diameter, expressed as a percentage of the known resistance of the plunger to various penetrations in crushed aggregate, notably 13.24kN at 2.5 mm penetration and 19.96 kN at 5.0 mm penetration. 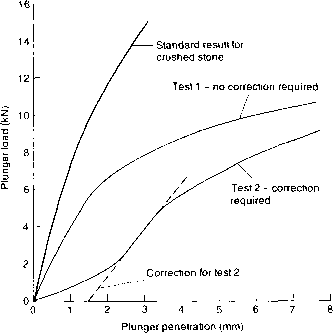 The reason for the odd dimension of 49.6 mm for the diameter of the plunger is that the test was originally devised in the USA and used a plunger with a cross-sectional area of 3.0 square inches. This area translates as 1935 mm2 and, as the test is international, it is impossible to vary this area and therefore the plunger has a diameter of 49.6 mm. Fig. 11.10 The California bearing ratio test. The dial gauge may be replaced by a displacement transducer. is the in situ value used for the field compaction. However if the final strength of the subgrade is required a further CBR test must be carried out with the soil at the same dry density but with the water content adjusted to the value that will eventually be reached in the subgrade after construction. This value of water content is called the equilibrium moisture content and is discussed in Chapter 12. The dry density value can only be truly determined from full-sized field tests using the compaction equipment that will eventually be used for the road construction. Where this is impracticable, the dry density can be taken as that corresponding to 5 per cent air voids at a moisture content corresponding to the omc of the standard compaction test. In some soils this will not be satisfactory - it is impossible to give a general rule; for example, in silts, a spongy condition may well be achieved if a compaction to 5 per cent air voids is attempted. This state of the soil would not be allowed to happen in situ and the laboratory tester must therefore increase the air voids percentage until the condition disappears. With its collar, the mould into which the soil is placed has a diameter of 152 mm and a depth of 177mm.The soil is broken down, passed through a 20 mm sieve and adjusted to have the appropriate moisture content. The final compacted sample has dimensions 152 mm diameter and 127 mm height. (i) Static compaction: sufficient wet soil to fill the mould when compacted is weighed out and placed in the mould. The soil is now compressed into the mould in a compression machine to the required height dimension. This is the most satisfactory method. (ii) Dynamic compaction: the weighed wet soil is compacted into the mould in five layers using either the BS2.5kg rammer or the 4.5 kg rammer. The number of blows for each layer is determined by experience, several trial runs being necessary before the amount of compactive effort required to leave the soil less than 6 mm proud of the mould top is determined. The soil is now trimmed and the mould weighed so that the density can be determined. After compaction the plunger is first seated into the top of the sample under a specific load: 50 N for CBR values up to 30 per cent and 250 N for soils with CBR values above 30 per cent. The plunger is made to penetrate into the soil at the rate of 1.0 mm/minute and the plunger load is recorded for each 0.25 mm penetration up to a maximum of 7.5 mm. Test results are plotted in the form of a load-penetration diagram by drawing a curve through the experimental points. Usually the curve will be convex upwards (Curve Test 1 in Fig. 11.11), but sometimes the initial part of the curve is concave upwards and, over this section, a correction becomes necessary. 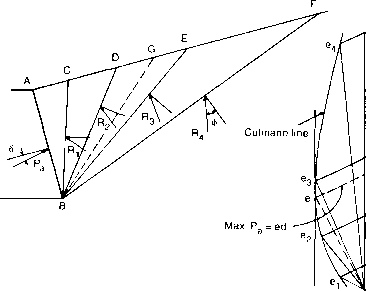 The correction consists of drawing a tangent to the curve at its steepest slope and producing it back to cut the penetration axis. This point is regarded as the origin of the penetration scale for the corrected curve. Fig. 11.11 Typical CBR results. 19.96 kN. The higher of these two percentages is taken as the CBR value of the soil tested. When a subgrade or a sub-base material is to be tested the increase in strength due to the road construction material placed above can be allowed for. Surcharge weights, in the form of annular discs with a mass of 2 kg can be placed on top of the soil test sample. The plunger penetrates through a hole in the disc to reach the soil. Each 2 kg disc is roughly equivalent to 75 mm of surcharge material. When an existing road is to be reconstructed the value of the subgrade strength must be determined. For such a situation the CBR test can be carried out in situ but it must be remembered that the water content of the soil should be the equilibrium value so that the test should be carried out in a newly excavated pit, not less than lm deep, on the freshly exposed soil. There are alternatives to the CBR test. Black (1979) has shown that in situ subgrade strengths can be measured by cone penetrometer tests, carried out in boreholes. Also the equilibrium subgrade strength of the most common cohesive soils in Britain can be obtained by a soil suction method described by Black and Lister (1979). Table 11.1 Equilibrium suction-index CBR values. Reproduced from TRRL Report LR1132 (1984). How to determine cbr test surcharge? What is the latest C.B.R Corrected value at 2.5mm And 5.0mm is it 13.24 and 19.96? When is correction of CBR curve called for? How will you correct the initial concavity in load penetration curve of CBR? How to check cbr plunger value? What are the number requirements for suitable soil for CBR test graph? Why is the initial portion of load penetration curve concave upwards? What are the causes of the initial comcavity of load penetration curve? Why correction is applied in CBR graph? What is corrected load in CBR test? How to estimate cbr from load penetration curve? How to plot graph for CBR test? How to take corrected value of loads when initial convaity occurs by graph?